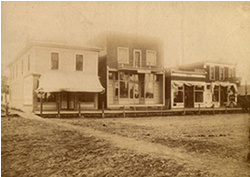 The community of Walnut Grove began in 1870. The 1870’s were exciting times. A nation, fresh from civil war, had literally been ripped apart. Its citizens sought new beginnings far from the settled eastern states. The Homestead Act of 1862 urged pioneers, sodbusters and immigrants to ‘head west’ and make their mark on the great expanse of the Plains. It was a time of change and progress in communications and travel. A telegraph system joined the country from coast to coast in 1861. East and West were joined by rail in 1869. During the 1870’s, the village of Walnut Grove grew. Pioneers settled along the banks of Plum Creek. The land was rich and game was plentiful. Hardships were common on the prairie. A grasshopper plague almost destroyed the settlement in the 1870’s. Perseverance, hard work, and a strong Christian faith carried the community through the many hard times. Lafayette Bedal, the village’s first postmaster, opened his home to the children in 1873 conducting school classes in his living room. The Congregational Church was built in the village in 1874. Other buildings included: three general stores, hardware, drug, grocery, flour mill, feed stores, hotel, confectionery, lumber yard, fuel dealer, harness shop, shoe shop, blacksmith shop, meat market, elevator, a doctor’s office, a law office, and one saloon. 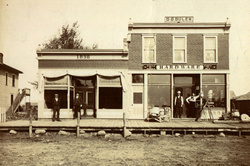 Walnut Grove was incorporated on March 18, 1879. Its name came from the beautiful grove of walnut trees along the banks of Plum Creek. The first village officials were: Elias Bedal, president; T. Quartan, J. Leo and C. Clementson, trustees; F.H. Hill, recorder; W.H. Owens (William Oleson), treasurer; J. Russell, constable; and Charles Ingalls, justice of peace.